Ionic Silver or Colloidal Silver? Are They The Same? 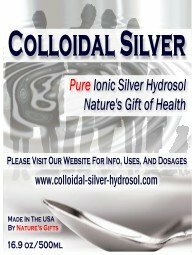 Ionic silver or colloidal silver, which is better? Or are they the same? There's a lot of confusing information out there, some by accident and some because makers of colloidal silver want you to think their version is the best in spite of the science. And what is the science? That regardless of what form silver takes, it's the IONS that are released that do the work. Ions are bio-active because of the missing electron. So we are searching for a source of silver ions in the end. Please see our "Research Studies" page for more information, helping to sort out the confusion between ionic silver or colloidal silver. A colloid is the suspension of one thing into another. Milk is a colloid. Colloidal silver simply means silver mixed with water. For the silver to remain in suspension means the silver has to be incredibly tiny. We are talking about 1 nanometer to 1000 nanometers in size for colloids. Ions are less that 1 nanometer in size. Technically, pure ionic silver is a "solution" not a colloidal but commercially, "colloidal" has been used to describe any combination of ions (dissolved in solution), atoms (colloida), crystals (clumps of atoms that usually settle out) and salts (silver bonded to something else and usually settle out of the water). So for our product, we use the commercial designation of "colloidal", but make it very clear that our product is pure ionic, which is why it's crystal clear. The ions are 1/4 of a nanometer, dissolved in pure distilled/deionized water, and at 6 ppm, that's estimated to be 1,000 trillion ions per serving! That's more than there are cells in the body! What About PPM, Parts Per Million? 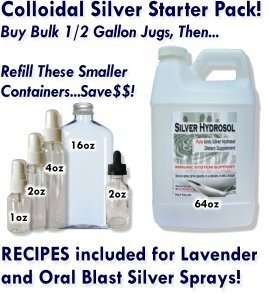 If your colloidal silver contains particles 1000 nanometers in size, what's the body going to do with it? By comparison, 45 BILLION, that's 45,000,000,000 separate ions can occupy the same space as ONE particle that is 1000 nanometers in size! If you're going to fight an enemy, do you want on big cannonball or 45 billion arrows? Makers of colloidal silver will get shoppers fixated on PPM levels but only those with small particle sizes and/or high ion content will make you aware that PPM is NOT the telltale of a potent product. Pure ionic silver can't be made in solutions at high PPM's. Solubility of silver ions is limited in water, but high PPM's aren't needed. It is needed for products relying on particles to spin off ions, but when you're using a pure ionic product, you've already got what you're looking for. Again, it's the bio-active component that determines effectiveness. 20 ppm of silver particles doesn't have the same strength as 20 ppm of silver ions. In fact, because pure silver ions are so efficient, much lower concentrations are needed to be effective. 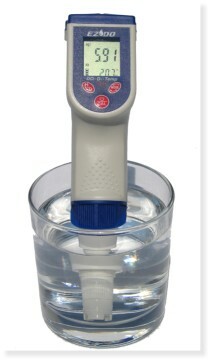 Our product is just under 6ppm. Fred Preschel, the engineer that mastered the formulation of ionic silver, saw that that was enough. 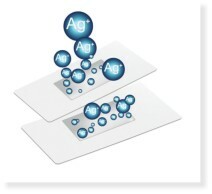 One tablespoon of ionic silver using his technology contains 1,000 TRILLIION silver ions! So What Am I Getting When I Buy "Colloidal Silver"? That totally depends upon the process used to create it! That's why it pays to do your homework and part of that homework is to sample products to see what works. As we said, PURE ionic silver is clear. If the product you're looking at is NOT clear, then it's a combination of atoms, crystals, salts, etc...., or something added to give it color. Afterall, who wants to buy something that looks like water? You will once you realize that IONS do the job! A particle of silver is not bio-active unless a silver ion emerges from it. You want ions...so buy ionic silver. What Is A Silver Ion? An ion of silver is a silver atom that is missing one or more electrons, giving that atom an electrical charge. That's what makes ions bio-active because it's seeking what it's missing....it wants that missing electron so it will get it from something else, causing a reaction. Ionic silver doesn't have the problem of settling out of the water because the positive electrical charge of all the ions continuously repel the ions apart, so they stay put, floating throughout the water! That means each serving is uniform! And it means a superior shelf life for a couple reasons. First, the ionic nature keeps the ions in suspension and, second, the silver ions keep the water pure! And A Silver Atom? A Crystal? And A Salt? Atom of silver - the smallest particle of silver. It has a negative surface charge in a colloidal state. This charge is like a static charge, which has minor biologic benefits. In comparison, the ion's POSITIVE charge makes it bio-active. Crystal of silver - many silver atoms chemically bonded together. They may have a negative surface charge in a colloidal state but are usually too large (will continue growing) and will settle out. Salts of silver - chemically bonded silver ions to other materials that were dissolved in the starting water. They are usually poorly soluable and thus form crystal growths and settle out. What About The Tyndal Effect? Will That Help Me? Yes!! But not in the way the conventional wisdom tries to teach us! A popular measure of the existence of a colloid, such as colloidal silver, (but not milk, which is also a colloid) is the Tyndal effect of "the dispersion of a light beam shown thru the liquid". A cloudy path of the light beam will be evident if there are colloidal particles in suspension! It is visible in colloids as weak as 0.1 PPM. Ions, the preferred form of silver, are NOT visible, even with a high powered microscope! Thus, a strong Tyndal effect is an indication of larger silver particles and thus LESS bioavailability while a weak Tyndal effect indicates more ions of silver, assuming you are comparing the same PPM. Remember, ions do the work, not particles. Particles can release ions but why buy a bottle of particles when you can buy a bottles of ions? So What's Better? Ionic Silver or Colloidal Silver? Ionic silver or colloidal silver? We hope you have a clear distinction now between the two. To review, scientifically, colloidal refers to larger particles than ions. Commercially, "colloidal" includes everything. Ions do the work...it's what we are looking for. All forms of silver spin off ions, but why leave it to chance when you can buy pure ionic silver? Try it and find out! Don't take our word for it. Research the internet, sample products, etc.... What's effective will stand on its own merits! Need a challenge? Scour the internet for any and all anti-bacterial silver products and notice that it's always "silver ions" that are advertised to be THE agent that kills the bacteria.